Donald Trump’s lewdness towards young women has caused an uproar that looks set to end his chances of winning the presidency. By contrast, his attacks against Hillary as an older woman have barely drawn a murmur. Trump and his supporters have conducted a vicious campaign against Hillary using her age as a weapon against her. As though being an older woman is contemptible. They have played on negative stereotypes of old women and used scary, nursery rhyme images of witch-like women. “Crooked hag” is just the latest double-barrelled epithet they have hurled at her. Instead of being inconspicuous like many older women, instead of babysitting the grandchildren and confining herself to a domestic landscape, Hillary Clinton, aged 68, is fighting for the most powerful position in the most powerful country in the world. She is not only threatening to smash the glass ceiling, but to shatter an entire system of beliefs that consigns old women to invisibility. When Donald Trump said Hillary Clinton did not “ look like a president”, he meant that a woman did not fit the image of a president. He was referring to her gender. But when Donald Trump in the first debate, amended his statement and said that Hillary Clinton “did not have the stamina to be president”, he meant that an older women could not handle being president. He was referring to her age. And to the stereotype of a frail, old lady. 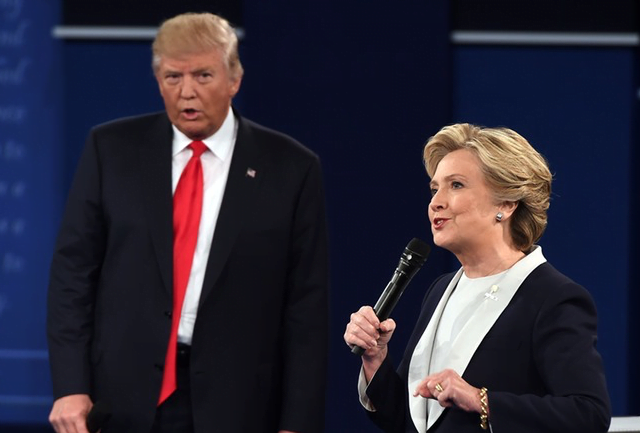 Undeterred by the fact that he is two years older than Clinton, Trump elaborated on the caricature of an aged woman by saying that as president “she’s supposed to fight all these different things and she can’t make it 15 feet to her car.” This was accompanied by his parody of a weak woman barely able to walk. Oddly, as a label, “old Donald” does not resonate in the same way amongst many voters. Despite his age, he is able to present himself as sexually super-charged, vigorous, powerful and successful. Powerful old men, weak old women. We have no problem trusting older or old men to be our political leaders. We believe that their age endows them with years of accumulated experience, even wisdom. But older women? Women over 60? There are no precedents for old women being elected as leaders in democracies. Theresa May aged 60, was parachuted into her position to replace David Cameron by the Conservative Party leadership and has not yet stood for election. Golda Meir, at age 71 was similarly parachuted into the prime ministership by Israel’s Labor party following the sudden death of Prime Minister Levi Eshkol. Margaret Thatcher was only 54 when first elected. Indira Gandhi was 49 when first elected prime minister of India. Angela Merkel was 51 when she became Chancellor of Germany. There are no precedents for what Hillary is doing at her age. And this may be a decisive reason why the American public has trouble accepting her as their leader. Alive to the prejudices of his audiences, Trump is skilfully presenting the public with a caricature of what might be unpalatable to them – an old woman in charge. Hillary Clinton reflects a much broader phenomenon whose scale is unprecedented. For the first time in history, there are millions of highly educated women who have professions and have spent much of their lives in the workforce. Now they are entering retirement. Now what? Given that life expectancies for women have risen to the age of 90, it is a long time to babysit, garden or play golf. Women ageing is the last frontier of feminism in developed countries. After fighting for equality and the particular problems in the life cycles of girls and women, feminists have failed to address these same issues in the life cycle of older women. And this is because many feminists of the ‘60s are only now hitting their own 60s. Only now are they themselves facing the problems of older women and the double standard in perception and expectations. Ageing women find themselves without roadmaps of how to live the rest of their lives. We may not all want to follow the road that Hillary Clinton is taking, but as a role model, she inspires us to reject traditional expectations.